MIAMI -- So, according to Dwyane Wade's logic, Sunday was more like a pop quiz. After pushing his recovering right knee through games on consecutive nights for the first time in more than six weeks, the Miami Heat star guard believes the bigger test waits Monday morning. The Heat's next game isn't until Tuesday against the New Orleans Pelicans. But Monday is treatment day. In other words, it's evaluation and test day. Wade's goal is to be relatively healthy enough to be back on the court Tuesday and play three games in a span of four nights. Mike Ehrmann/Getty Images Dwyane Wade was strong late his first complete back-to-back performance of the season. Getting through Monday's rest and recovery sessions are the initial priorities. And Wade insisted Sunday night that he won't know how well his knee truly held up after he played a combined 71 minutes over the past two games in as many nights until he wakes up Monday and heads to Miami's practice facility. The early returns, however, were encouraging. "My legs felt good," Wade said after he finished with 14 points, nine rebounds, three assists, two steals and a block in Sunday's 102-97 win against Toronto. "[Monday] is a big day. We have a game Tuesday, so three games in four nights. [Monday] is a big day to get some rest and get some treatment and hopefully feel good on Tuesday. That's going to be my biggest test, I think." Wade has progressed methodically through a rehabilitation program that began after he underwent a shock-wave therapy procedure over the summer to treat the multiple right knee bruises he sustained last spring. The injury limited Wade's play during the Heat's run to their second straight title. Now close to the end of the six-month, post-procedure window trainers told him it would take to regain significant strength in his knee, Wade felt he was ready to see how far he'd come since the setback he sustained when he last tried to play in a back-to-back set in mid-November. That previous test ended in disaster, with Wade leaving a Nov. 16 game in Charlotte in the third quarter after he could no longer play through the pain. He decided to play in that game, in part, because the Heat were shorthanded at guard, with Mario Chalmers serving a one-game suspension and reserve Ray Allen away from the team with an illness. At the time, Wade felt obligated to help the team by playing on the road against the Bobcats a night after he had 17 points, eight assists and eight steals in 36 minutes in a home win against Dallas. The move forced Wade out of action for a week, and he would later regret his decision to play. Wade has missed a total of eight games this season amid a maintenance program designed to periodically give him nights off to rest his knees. The Heat have played three back-to-back sets in the past seven weeks, and Wade has sat out the front or back end in each of them. But he left open the possibility that he might play Sunday after Saturday's 110-94 win in Orlando, a game that saw Wade score 20 points in 36 minutes. After the game, Wade said he would go through his normal pregame evaluations, warmups and meetings before deciding if he would play Sunday. Wade revealed after Sunday's game that he had every intention of playing when he got to the AmericanAirlines Arena. After pushing through extensive workout sessions in recent weeks with personal trainer Tim Grover, in addition to his work with the team, Wade said it was time to see how far he had come with the condition of his knee. "I did [know]," Wade said of his availability for Sunday's game. "But I wanted to go through the proper channels, do all the things I needed to try to get prepared. I did that, and was able to play. It was good to play my first full back-to-back." It ended up being a decision -- and a performance -- that surprised some of his teammates. "It was good to see him out there," center Chris Bosh said. "You have to shock your body a little bit. Back-to-backs are tough, and it's good to have that mental exercise to have to push your body through that. Usually in the second games, he has some soreness. But he's feeling good. It was good for him and it was good for us ... to continue to try to put this thing together and making sure we're taking steps forward instead of backward. We need everybody playing at their best." Sunday's performance would hardly register as one of Wade's best efforts, especially early. He battled through an uneven start, but had his best stretch in the fourth quarter as the Heat overcame a nine-point deficit in the second half. 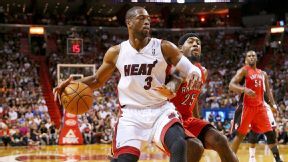 Wade had six points and four rebounds in the final period, and LeBron James led the way with 30 points. James has had to balance the burden that comes with adjusting his game on nights when Wade is out of the lineup. Earlier this season, James talked about how some of the injuries throughout the roster have made it difficult for Miami to establish much continuity. But he's always said Wade is wise to err on the side of caution when it comes to ultimately getting his knee healthy. Even with the routine absences, Wade is averaging 19.4 points and shooting a career-best 53.5 percent from the field. "For him to be in the lineup shows that he's feeling pretty well," James said of Wade. "He's doing everything it takes to keep himself in the lineup. And we'll just play it by ear. Obviously, he's very smart with it. He knows his body better than anyone." Wade also knows there are no back-to-back sets in the playoffs. So trying to sort through the type of challenge he faced over the weekend isn't something that could have any long-term implications. But he said his goal was to see how much soreness and discomfort he could tolerate at this stage of the season. "It really has been day to day," Heat coach Erik Spoelstra said. "We try not to go into it with a preconceived notion, even on the back-to-back sets. We're open-minded about it. As long as he's able to stick with his very specific routine, working out, strength training, conditioning and a lot of treatment ... then we're open to how he feels day to day." Wade said the Raptors were a good barometer to gauge his progress because they have a lot of athletic wing players who could be tough to defend on the move. "[I] just [wanted] to be able to see if I could play without a lot of discomfort," Wade said. "I know I could play with some discomfort. I wanted to see if I could move the way I wanted to move, knowing they could get up and down. I just wanted to make sure I was able to do all that. I felt I did. It was a good one, a good first back-to-back for me." MVP: LeBron James. He is the best player in the world, after all. Toronto tried five different defenders on him to no avail, and he finished with 30 points, 10 in the fourth. Unstoppable. X factor: Dead last in the league in offensive rebound rate by a significant margin, the Heat grabbed 14 offensive rebounds Sunday for 16 second-chance points. That was ... another statement. Wins over Dallas and Oklahoma City on the road, Indiana at home, and now a narrow loss at Miami. These Raptors may be for real, and we'll learn a little more Tuesday at Indiana. MVP: In a balanced effort for the Pacers, when five guys scored between 10 and 16 points, this goes to Team Defense. The NBA's best held Cleveland to 34 percent shooting and forced 18 turnovers. X factor: Oftentimes serving as Cleveland's only respectable offense, C.J. Miles finished with 21 points on 8-of-13 shooting, with three offensive rebounds, three assists and helped on defense, pitching in three steals. Defining moment: From two timeouts in the final 20 seconds, down one score, Cleveland called an isolation, and a play in which the guy catching the inbound was standing out of bounds. Creative play-calling it was not. MVP: Klay Thompson put up the team-high in points (26), but David Lee's 21 and 11 helped set the tone for the Warriors early and was key in opening up the perimeter. Twelve of Lee's points came in the third quarter when no one on the Wizards, from Nene to Jan Vesely, could stop him. LVP: Washington's Bradley Beal is now 14-for-44 from the field so far in the new year. Golden State allowed Beal all the looks from midrange he wanted, and that's the inefficient shot he often settled for. Beal has also attempted only one free throw, a miss, through three games in 2014. X factor: Andre Iguodala switched to guard Beal more in the second half and completely shut him down. Beal shot 4-for-6 in the first quarter when Klay Thompson mostly checked him. Over the rest of the night, Beal shot 0-for-9 from the field. MVP: Reggie Jackson had a night to remember, posting a career-high 27 points on an incredibly efficient 9-of-12 shooting night. The point guard also scored 19 of his points in the first half, helping the Thunder build a double-digit lead early in the contest. LVP: Brandon Bass, Boston's starting power forward, was nearly invisible on the floor, scoring a mere four points on 1-of-5 shooting over 25 minutes of action. Oklahoma City's big men also dominated Bass and the rest of Boston's undersized front line for most of the night on the offensive end. X factor: Turnovers The Thunder took great care of the ball (nine turnovers) all night. Meanwhile, the Celtics had 11 of their 16 turnovers in the second half, providing the Thunder with countless easy scoring opportunities on the miscues, which allowed the hosts to pull away late. MVP: Kenyon Martin helped set the tone for the newly re-energized 'Bockers with his play at both ends. K-Mart flashed his elite athleticism around the rim, finishing with a season-high 14 points, and helped lead the Knicks to a decided advantage on the boards. X factor: Tyson Chandler lasted just four minutes in his return to Dallas, but that didn't stop the Knicks from hitting the glass. Six New York players had at least six rebounds as the Knicks outhustled the Mavericks to a 47-34 rebounding advantage. That was ... quite a road trip: Desperate for an identity, the Knicks have looked like a different team since the new year. They sandwiched wins in San Antonio and Dallas with a narrow loss in Houston. The Knicks need to carry this type of energy into every game from here on out. LeBron James, Heat: Dropping in 30 points on 12-for-18 shooting is just what the Heat needed in a 102-97 win on a night when the upstart Raptors were primed to deliver another upset performance. Missed all six of his 3-point attempts en route to a 2-for-14 outing in a 112-84 loss to the Grizzlies. The arc has not been friendly to Jennings -- he's hoisting 5.2 per game, but is making 25.9 percent. "How much more am I supposed to support a guy? Besides making a Pau flag and riding in there on a horse with Spanish colored paint on my face, looking like a Spanish William Wallace or something? I dont know what else to say." Mark D. Smith/USA TODAY Sports Reggie Jackson got past Avery Bradley and the Celtics and posted a career-high 27 points on 9-of-12 shooting in the Thunder's 119-96 win over the visiting Celtics. The New York Knicks defeated the Dallas Mavericks 92-80 to complete a three-game swing through Texas with a winning mark, having previously beaten the San Antonio Spurs and lost to the Houston Rockets. This was only the 10th time in the past 30 seasons that the Knicks visited the NBA's three teams from Texas in succession. They won as many as two games on only one other of those trips, with wins at Dallas and Houston in March 1996. MVP: It was a team effort for Denver, but Timofey Mozgov was the spark they needed on both ends of the basketball court. Coming off the bench, Mozgov had a higher plus-minus than four of the starters and finished with 20 points, seven rebounds and two blocks on 8-for-10 shooting from the field. X factor: The Nuggets' rebounding advantage. Denver out-rebounded the Lakers 58-38, an exceptional margin, including 17 offensive boards that gave them extra possessions. Pau Gasol was the only Laker with more than six rebounds, while the Nuggets had four such players. That was ... a barn-burner. Not a lot of defense being played on this night, with the teams combining for 252 points and both shooting above 47 percent from the field. Six players finished with 20+ points, and 11 in double figures. The game even turned into a mini-All-Star game down the stretch with one wide-open, crowd-pleasing slam after another. MVP: Zach Randolph. The All-Star forward has been beasting lately for the Grizzlies and Sunday was no execption. He put up 16 points and 16 rebounds against Detroit's big front line, his fourth 15-15 game in the last eight games. X factor: Jon Leuer matched his career high with 23 points, 16 coming in the first half to keep the Grizzlies close before the starters took over after intermission. Leuer's 23 were more than the entire Pistons bench scored. LVP: Brandon Jennings dished out 11 assists, so it wasn't a total loss, but Jennings scored just four points on dismal 2-of-14 shooting. He went 0-for-6 from 3-point range, and is shooting just 30.5 percent overall during Detroit's 4-game skid.